Well, my seventh anniversary started off in Trastevere, where I was hanging out with my roommate and a couple of his friends until the wee hours of the morning. I thought that nothing could be scarier than speeding through the streets of Rome at 60-70km per hour on a tiny scooter at 10pm, but I was wrong. Speeding through the streets of Rome at 60-70km/hr at 3am after a few beers with the driver singing Cher songs and putting on his "serious face" as we pass cops stopping people for drunk driving is scarier. Now I feel like I've gotten the quintessential Italian experience. I came home to find that these had arrived from Patrick (awwww, sweet!). Apparently Italian florists don't write on actual cards. There was a tiny little envelope and inside was a small strip of paper that looked like a ransom note that had been photocopied 20 times. 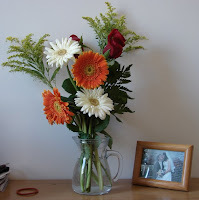 I put them in a little vase (ok, so it's a water pitcher, but I live with all guys, so there aren't vases in the house) and set them on my desk next to my favorite picture from our wedding. Awwwww. After sleeping until well after noon for the first time in years, I got up and made pancakes. 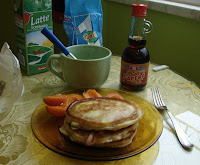 Yesterday I found maple syrup (real maple syrup too) at the Auchan grocery store. It cost 6.50E for 250ml, but it was sooooo worth it. Since I didn't have a recipe, I found this one online and it's quite good. It makes giant fluffy pancakes, as you can see. I was reading the label on the maple syrup, and there's a little paragraph about what you can do with it (since no Italian has any idea what maple syrup is. Actually Marco was telling me about how he went to an IHOP or Denny's when he visited the U.S. in high school, and he and all his classmates were practically drinking the syrup because they thought it was so good.). The label reads, "Maple syrup is a natural product, without artificial flavors or preservatives. It is an alternative to sugar or honey. Consider it for dessert, herbal tea, grilled fruit, yoghurt, and for a breakfast high in energy. In America, it's called 'The sugar of health.'" Sure, I would consider it for grilled fruit, but for herbal tea? Ew. And who calls maple syrup the sugar of health? I plan to be lazy for the remainder of the day and perhaps go out to dinner with my friend Sara, who just got her motorcycle license and a new motorcycle. The Italians will kill me yet.